This family contains 13 genera with approximately 60 species. Cranchiids are small (Helicocranchia: ca. 100 mm mantle length [ML]) to large (Mesonychoteuthis: ca. 2000 mm ML) squids that possess a large buoyancy chamber and, hence, the common name "bathyscaphoid squid." In general appearance they often appear to have bloated bodies and short arms. The mantle is generally thin but muscular. Several species have been observed in deep water from submersibles to exhibit a peculiar posture (cockatoo posture) with the arms and tentacles folded back over the head (Vecchione and Roper, 1991). Cranchiid paralarvae are common in near-surface waters and many remain in this habitat until reaching a rather large size (ca. 50-100 mm ML). Most species occupy progressively deeper waters as they grow larger (ontogenetic descent). This is one of the more speciose families of squids with about 60 species, many of which are undescribed (Voss, et al., 1992). with head fused to mantle at three points (ie, at funnel and nuchal locking-apparatuses). with coelom modified into a large buoyancy chamber. Armature of suckers or hooks in two series. Fused to mantle at nuchal cartilage. For an introduction to Cranchiidae beaks go to the subfamily pages. Both funnel locking-apparatuses fused to mantle components; often traces of original locking apparatus absent. Funnel retractor muscles form broad, horizontal membrane dividing mantle cavity into ventral and dorsal chambers. Large buoyancy chamber (coelom) extends full length of mantle. Digestive gland generally spindle-shaped and situated well posterior to cephalic cartilage. Variable. See summary of gladii here. Most paralarvae with eyes on stalks. A list of all nominal genera and species in the Cranchiidae can be found here. The list includes the current status and type species of all genera, and the current status, type repository and type locality of all species and all pertinent references. Figure. 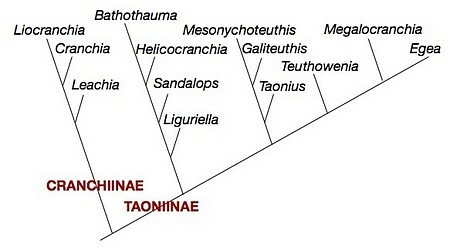 Phylogenetic relationships of the Cranchiinae based on morphological characters. Modified from Voss (1988), shows branching relationships only. The phylogenetic relationships shown above are from Voss (1988). An earlier study (N. Voss and R. Voss, 1983) was the first cladistic study undertaken on cephalopods. Many cranchiids spend much of their life in the upper depths of the ocean in partially sunlit waters. For concealment under these conditions, they are often transparent except for the eyes and the visceral nucleus. The visceral nucleus is generally spindle-shaped and maintains a vertical orientation to minimize the shadow that it casts (Seapy and Young, 1986). The eyes, often with ventral photophores, also maintain a constant orientation not only for concealment but, as in most cephalopods, as a visual aid to assist interpretation of objects in the environment. The ability of cranchiids to maintain the digestive gland in a vertical orientation can be seen the the photographs below. Squid were photographed in a shipboard aquarium with vertical lines placed on the back of the tank. Note the vertical orientation of the visceral nucleus of this squid when its body is in two different postures. Figure. Side views of Leachia pacifica in different attitudes. Photographs by R. Young. Probably all species have paralarvae in near surface waters. Some paralarvae reach a large size (ca. 50-100 mm ML) before descending into deep water as juveniles. Paralarvae of most species are easily recognized as belonging to this family by their long eyestalks. This is especially pronounced in paralarval Bathothauma. Many species go through marked morphological change with growth and at maturity. These can involve changing eye shape and position, changing fin shape, increased pigmentation, development of photophores on arm tips, various modifications of arm structure and, apparently, loss of tentacles. These changes have led to many developmental stages being named as separate species or genera. Based on slim evidence, females seem to be semelparous (terminal spawners). Seapy, R. R. and R. E. Young 1986. 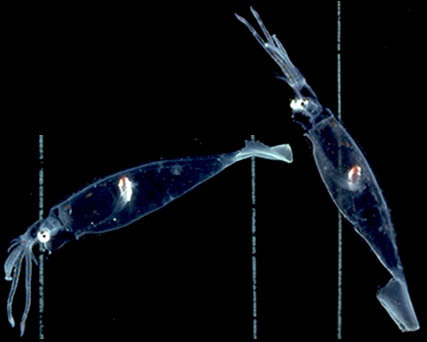 Concealment in epipelagic pterotracheid heteropods (Gastropoda) and cranchiid squids (Cephalopoda). J. Zool., Lond. (A), 210: 137-147. Vecchione, Michael and Clyde F.E. Roper. 1991 Cephalopods observed from submersibles in the western North Atlantic. Bulletin of Marine Science, 49(1-2):433-445. Voss, N. A. and R. S. Voss. 1983. Phylogenetic relationships in the cephalopod family Cranchiidae (Oegopsida). Malacologia 23: 397-426. Voss, N. A. 1988. Evolution of the cephalopod family Cranchiidae (Oegopsida). P. 293-314. In: (M. R. Clarke and E. R. Trueman, eds. ), Paleontology and Neontology of Cephalopods; The Mollusca, 12, Academic Press, Inc., New York, 355pp. Page: Tree of Life Cranchiidae Prosch, 1847. Bathyscaphoid squids. Authored by Richard E. Young and Katharina M. Mangold (1922-2003). The TEXT of this page is licensed under the Creative Commons Attribution-NonCommercial License - Version 3.0. Note that images and other media featured on this page are each governed by their own license, and they may or may not be available for reuse. Click on an image or a media link to access the media data window, which provides the relevant licensing information. For the general terms and conditions of ToL material reuse and redistribution, please see the Tree of Life Copyright Policies.